10 months later, here I was on this mother/sisters trip. I badly needed a break-away from routine after a rough start to 2017 (taking care of my husband after his open-heart surgery, managing major change at work, etc.) and I was happy that I made that decision (although I felt really sorry leaving my husband and two girls behind, but made up my mind to return to NZ with them next time). Tips: Planning singles-trip can be a headache especially when each of us live in different towns (and in my sister's case, country). Thankfully we had TripIt apps to help us coordinate our planning and consolidated all our bookings in an easy-to-refer-to itinerary. This way, we can see which day we have not booked / planned anything yet. Preparation to NZ was quite minimal since I've already bought warm clothes from our Osaka trip last year. Although it was spring season, weather at night was chilly so I packed a pair of thermal inner clothing, windbreaker, fleece jacket and a sweater for outer-layer. I also brought NZD700 cash for food, souvenir and emergency cash. We agreed that each of us was responsible to bring different items for the trip. I was tasked to bring pharmacy medicines, wet tissues and the likes, while my sisters bought instant rice (my sister bought the rice in Japan which required no water and just needed to be heated up in a microwave) and Brahim's instant food. We also did some grocery shopping when we reached NZ as it was easy to find halal food at the supermarket there. We took AirAsia flight with a short layover at Gold Coast. Unfortunately, despite joining a 5km run the day before, sleeping late to pack my bag and waking up early to travel to Miri to catch our flight to KL, I couldn't sleep for the most part of the 8+ hours journey. Eventually I did doze off towards dawn only to wake up 1 hour later. Upon reaching Australia, it was a rush to queue up for a quick immigration check, then a dash to the restroom for a quick relief before queuing up at the airline's counter to board the flight again. This time, I was upgraded to the quiet zone since my sister checked us in separately, and the airline wanted to accommodate a family request to sit together. The journey from Gold Coast Australia to Auckland took another 5 hours. 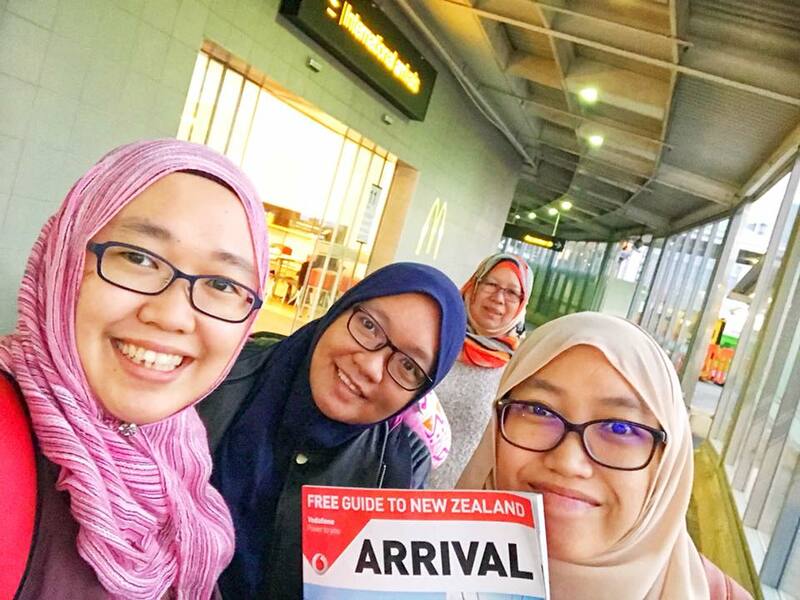 When we reached Auckland, we had to take a shuttle bus to the terminal and then started the long queue at the customs. NZ's biggest export is their farm produce (milk, fruits, vegetable you name it), so the government is very strict about fresh food items that goes through their border. They even require us to declare if our shoes have been used in sports activities outdoors! Tips: To speed up the process, prepare a list of food that you are bringing in (with translation if the food packaging is in local language) and only bring in food that are permitted (cooked / processed food like Brahim's instant chicken rendang that are sold in supermarkets are allowed if it is in its original packaging) and have the list ready for the customs officer to inspect. You may be lucky enough that they won't check the luggage if you have the list prepared ahead. 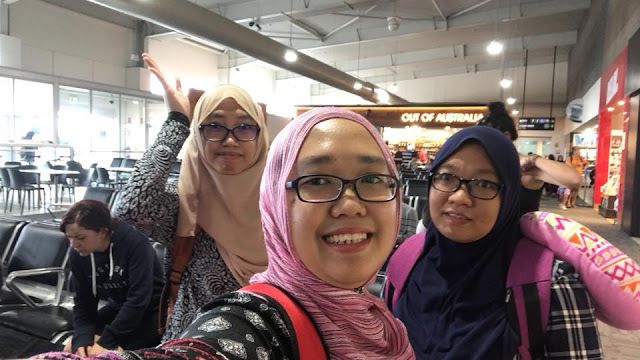 So the first thing we did when we reached Auckland Airport was to look for a prayer room to perform our Zohor & Asar prayers. I was impressed that Auckland International Airport is Muslim-friendly and there is a musalla on the first floor of the Arrival Hall (entrance next to McDonald's). 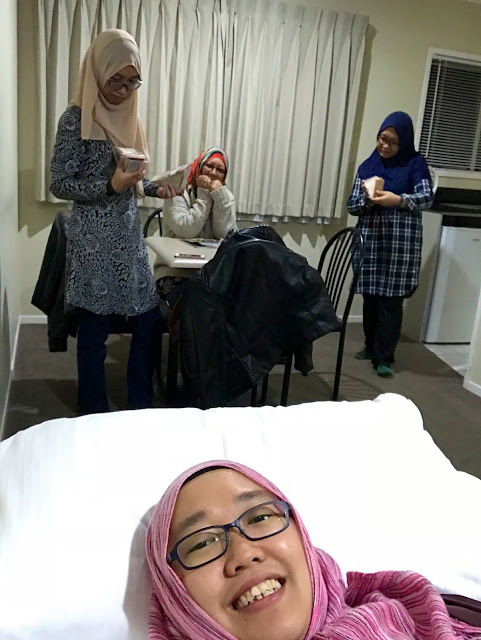 Then we went to buy a local SIM card (we decided to get Vodafone SIM card) so we could contact Auckland Airport Lodge where we were staying for the night before our early morning flight to Christchurch. Besides being in close proximity to the airport, the lodge also provided free shuttle service to and fro the airport and the lodge so it was really convenient to us. Tips: Auckland International Airpot does have accommodation adjacent to the airport, the Novotel Auckland Airport. There is also a budget hotel within walking distance to the hotel i.e. Ibis Budget Auckland Airport. While waiting for our shuttle van to arrive, we bought sandwiches (and chocolates, my favourite Whittaker's chocolate is really cheap in NZ!) for dinner at the airport. The journey to the lodge took about 10 minutes and upon arrival, we immediately checked in and was given our key. While it is no fancy stay, we really liked the lodge. Our studio unit is just a few metres away from the office and located on ground floor so no climbing required. The room is really spacious and easily accommodated the four of us. It is also super clean and after a long journey, the bed easily felt like the most comfortable bed we've ever laid on! Next entry, our NZ adventure began!